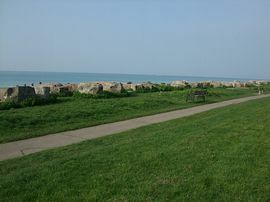 'Seashells' is situated in a prime location just off the seafront in Ferring. 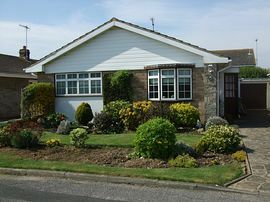 The spacious detached bungalow is within easy reach of village shops, pubs/restaurants and the beach is only a minutes walk away. The highly recommended 'Bluebird' seafront cafe is a few minutes walking distance and serves breakfast and meals throughout the day and The Rife provides a pleasant riverside walk. 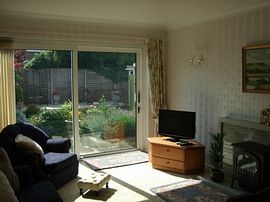 The property is well equipped and furnished to provide excellent, comfortable and relaxing holiday accommodation. 'Seashells' has gas central heating throughout with additional electric fireplace in lounge making it cosy at any time of the year. Worthing is the local town with many restaurants, theatres and shops. The South Downs National Park provides many picturesque downland treks or for those wanting the excitement of city life, Brighton is within easy driving distance, with its excellent shopping and numerous attractions. London is easily accessible by train or car. A minutes walk from beach. Comfortable & spacious property in peaceful setting. 2 dogs - will consider more, please enquire. Please contact us for details on the best way to reach this property. Price is for rental of property not per person and includes gas & electricity. Available all year. Short breaks available most of the year.